The nine-member Detroit Charter Revision Commission held its first meeting Jan. 10. It remains unclear which areas of the city’s “constitution” the elected body will revise. 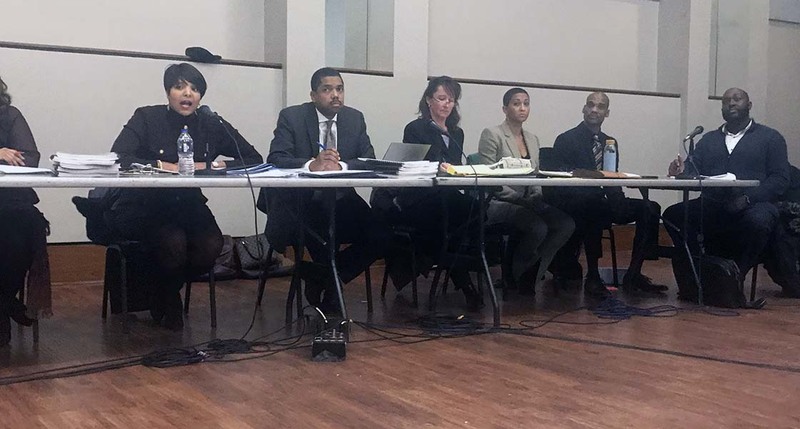 DETROIT – The 300 people who showed up last week for the first meeting of the Detroit Charter Revision Commission learned this much: Commissioners don’t get along, and they have no clear mission. The nine-member body, elected in November to revise the city’s governing laws, met for more than three hours before a standing-room only crowd at the Northwest Activities Center on Jan. 10. Members argued over bylaws, clashed over committee assignments and trampled over Robert’s Rules of Order, the standard guide for parliamentary procedure and how public meetings are supposed to run. Along the way, there was yelling from the crowd. The tension continued the next day, when commission members swiped at each other on Facebook. If there was any agreement, it’s that the commission is split between two factions: One that claims to represent everyday Detroiters and another that foes claim is aligned with Mayor Mike Duggan and billionaire Dan Gilbert. Amid the bickering, one thing is unclear: What’s the point of this charter commission anyway? The charter commission, which can only be formed by voters, last was seated in 2009, when it was created to recommend anti-corruption measures and to divide City Council into districts to improve accountability. Convoluted rules required an election last year to ask voters whether to convene another commission, which they did even though observers say no obvious charter problems have surfaced. “The previous charter commission, we knew exactly why we were elected and we organized to address those issues,” said Teola Hunter, a member of the 2009 commission. That may be true, acknowledged Carol Weaver, chairwoman of the commission. The commission will meet for up to three years exploring proposed changes to the Charter of the City of Detroit, the document sometimes called the city’s constitution. Recommendations from the commission go to the governor for review and then are put up for a vote among Detroit residents. Charter revisions can be big or small, ranging from grammatical corrections to structural changes in city government. The City Council sought the last charter commission to write into the charter a means to remove former Mayor Kwame Kilpatrick from office after he was charged with corruption. That panel proposed 144 revisions that were approved in 2011 by voters. Many of the 300 observers at the meeting said they showed up because they fear the mayor and businessman Dan Gilbert will try to steer the commission to revise the city charter in ways that do not favor working-class Detroiters. The commission’s role now, though, is altogether unclear. And it showed during last week’s meeting. Members fought over approving bylaws drafted by Commissioners Laura Hughes and Richard Mack, approving them by a 6-3 vote. Afterward, commission co-chair Nicole Small and Commissioner JoAnna Underwood complained that a motion to table approval of bylaws was overlooked and their counterparts were staging a coup. One spectator joked of getting “motion sickness” as the commissioners bickered over which motion they were voting on. “Some of us have definitely been excluded from the process,” said Small, who accused Mack of trying to take control of the meeting. Underwood objected to the involvement of city attorneys in the commission, arguing the group is supposed to be independent. She and Small are part of a group of commission members who ran together last fall on what they called “The People’s Slate,” along with Tracy Peters and Barbara Anne Wynder. They had boisterous supporters last week, especially Small who raised most of the objections at the table. “There is a lot of anger,” said Ruby Riley, a member of the civil rights group led by the Rev. Al Sharpton, the National Action Network. The biggest fear voiced among observers at the meeting is that a commission that has no stated mission could be swayed to recommend changes that take power away from the citizens, neighborhoods or city council in favor of corporate tax cuts, developers and gentrification. Among other things, some fear changes to the council’s budgeting process or weakening the city’s community benefits ordinance, which voters approved in 2016 to require developers of larger projects make promises to help neighborhoods. Riley said part of the reason so many people showed up to the meeting is due to rumors that some commissioners are puppets for Duggan and Gilbert, a downtown developer and founder of Quicken Loans. A spokeswoman for Gilbert confirmed that one commissioner works for a Gilbert-related company, but denied supporting any candidates for the commission. “We are proud that Karissa Holmes, an attorney who joined Rock Ventures less than 18 months ago in a senior counsel position, won a seat on the Detroit Charter Revision Commission,” said Gabrielle Poshadlo, a spokeswoman for Bedrock, Gilbert’s commercial real estate firm. Duggan’s office also said it isn’t aligned with any commissioners. “The mayor did not support re-opening the charter and he didn't endorse a single charter commission candidate,” John Roach, a spokesman for the city, wrote in an email. Commissioners Small and Underwood did not respond to requests for comment after the meeting. Weaver declined to say which topics she would like for the board to tackle. Mack said while no one knows the exact focus, the group still can do some good to improve governmental accountability. “Many of us felt the reopen may not have been necessary, candidly. But now that it is, we can suggest changes for the residents,” he wrote on Facebook. LaShawn Reece, member of a Detroit community group called The People’s Action, said she wants the commission to recommend more stringent rules on how long residents must live in the city before running for office. “It will be better once they get to know each other a little better,” she said of the commission. Ken Coleman, who served on the last charter commission, said the lack of a mission and collegiality are huge hurdles for the current group. The last commission, he noted, included a former deputy mayor, former city council staffers and a former member of the city ethics commission. The current commission includes community and union activists and at least four lawyers, but no one who has held elected office or worked in city government with the exception of Commissioner Barbara Anne Wynder who worked for the 1970-73 Charter Revision Commission as a staffer. “We better understood city government, we better understood public meetings, we better understood the value in having an open community process that did not violate the tenets and/or spirit of the Open Meetings Act,” Coleman said. The next meeting is noon Jan. 26 at the Samaritan Center, 5555 Conner on the city’s east side. Commissioner Wynder was also an Assistant Corp Counsel in the City's Law Dept. nearly nine years. "The commission will meet for up to three years... "
Any word on how much this will cost Detroit taxpayers? Good evening. What you said is true, but one thing I would had added is the audience reaction. For some their lack of understanding of the process and knowledge of what if any things in they want charter.